Fifth FPCCI Achievement Awards presented by Mohammad Pervaiz Malik – Federal Minister for Commerce and Textile – Malik presents award on their outstanding services in Insurance Savings (Family Takaful) to Mohammad Khalil of Jubilee Family Takaful. Karachi: Jubilee Life Insurance Company Limited - Window Takaful Operations has achieved the fastest Rs.3 billion milestone in a single year since its inception two years ago. 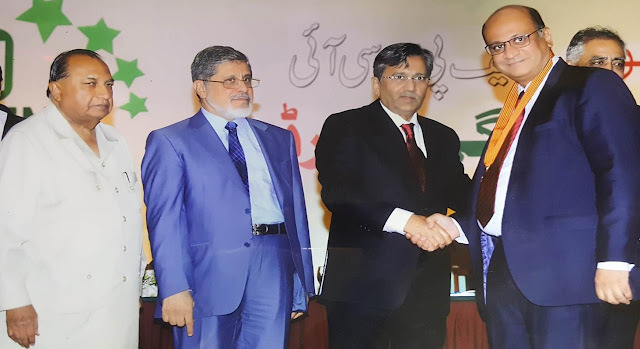 Simultaneously, it’s the first for any Window Takaful Operator in Pakistan, Jubilee Life-Window Takaful Operations has won the 5th FPCCI award for its Takaful Operations strengthening Jubilee Life - WTO’s position as the leading Takaful operator in the country. Jubilee Family Takaful has been dedicated within the industry in introducing innovative products and solutions to provide additional value to its customers and strengthening its relationship with them. The Window Takaful Operations has expanded its distribution channel far and wide to reach out to the entire nation with Takaful products.